After Pakistan’s retaliatory strikes, several unconfirmed stories are doing the rounds on social media. ThePrint tries to verify these claims. New Delhi: The Pakistan Air Force allegedly conducted retaliatory strikes Wednesday, in response to the Indian Air Force’s Tuesday morning attack on a Jaish-e-Mohammed terror camp in Balakot, Khyber Pakhtunkhwa province. However, after the PAF’s strikes, there have been several contradictory stories circulated on social media, most of them unconfirmed. While the short press briefing by India’s Ministry of External Affairs in the presence of Air Vice Marshal R.G.K. Kapoor of the IAF provided some clarity, many details remain foggy. ThePrint tries to verify these claims based on evidence or confirmation by respective authorities and sources. The list will be updated as and when more claims and information surface. Claim 1: Pakistan’s Air Force conducted air strikes against India in Jammu and Kashmir. The claim is that the PAF bombed four deserted spots near the Line of Control in Nidan, Laam Jhangar, Kerri (in Rajouri District), and Hamirpur area of Bhimber Galli in Poonch. Fact: The press briefing by MEA spokesperson Raveesh Kumar confirmed that “Pakistan has responded this morning by using its air force to target military installations on the Indian side”. While the Pakistani retaliation was confirmed, there was no mention of the precise targets on the Indian side. a) Pakistan’s Air Force shot down two Indian aircraft in Pakistani airspace. b) One of the aircraft fell inside Pakistan-occupied Kashmir and the other on the Indian side. c) “One Indian pilot arrested by troops on ground while two in the area”. Fact: The MEA press briefing confirmed that one MiG-21 Bison had been lost during the retaliatory engagement, while Pakistani PM Imran Khan said two Indian MiGs crossed the LoC and were shot down by Pakistani forces. The MEA also declared that the pilot flying the downed MiG-21 was ‘missing in action’. “Pakistan has claimed he is in their custody. We are ascertaining the facts,” the spokesperson said. But it remains unconfirmed whether Indian Air Force jets crossed the LoC or not. Claim 3: In response to the Pakistani attack, the Indian Air Force retaliated by shooting down one of its F-16 fighters in Nowshera. Fact: The MEA spokesperson confirmed that “the Pakistan Air Force was detected and the Indian Air Force responded instantly. In that aerial engagement, one Pakistan Air Force fighter aircraft was shot down by a MiG 21-Bison of the Indian Air Force. The Pakistani aircraft was seen by ground forces falling from the sky on the Pakistan side”. Whether the aircraft shot down was an F-16 remains unconfirmed. Claim 4: The last claim suggests the Pakistani Air Force did cross the LoC and intrude into India’s airspace. Claim 5: Some Indian journalists claimed that all Indian Air Force pilots were safe, but a Pakistani F-16 had been shot down. Fact: This is untrue. The MEA statement confirms that one IAF pilot is missing in action. Claim 6: Pakistani security agencies have arrested two Indian Air Force pilots. However, Pakistani PM Imran Khan insisted that “their pilots are with us” — note the use of the plural ‘pilots’. 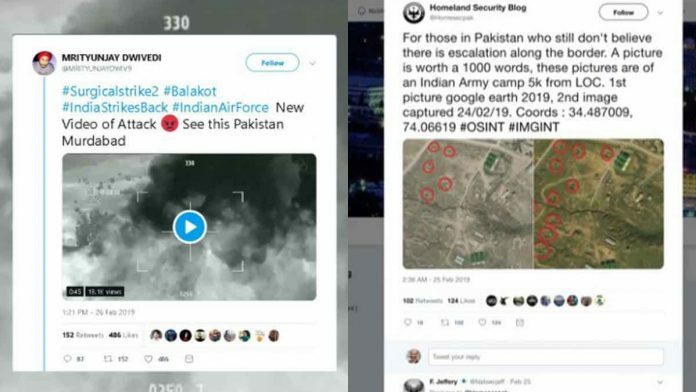 Claim 7: Pakistani media is using an image of IAF aircraft wreckage. Several other news outlets are using old images and videos depicting aircraft crashes. Fact: One of these videos is of a Hawk aircraft crashing in Odisha in 2018. Another image used by The Express Tribune newspaper in Pakistan, is three years old.